This topic has been moved to North KOREA. CNN) â€” A gunman shot and killed Russia's ambassador to Turkey Monday at an art exhibition in Ankara, Russia's foreign ministry said. 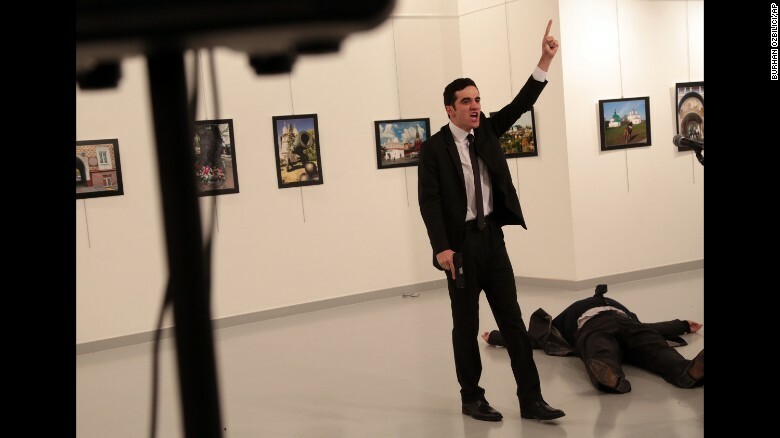 Ambassador Andrey Karlov was giving a speech at the opening ceremony of a photo exhibit when an assailant opened fire, Turkey's official Anadolu news agency said. The order comes amid rising tensions with the US over Syria and Putinâ€™s last-minute cancellation of a planned trip to Paris to meet with French President FranÃ§ois Hollande. â€œThis is all part of the package of measures to prepare elites to some big war,â€� Russian political analyst Stanislav Belkovsky told the Daily Star. â€œIf you want a confrontation, youâ€™ll get one. But it wonâ€™t be a confrontation that doesnâ€™t harm the interests of the United States. You want a confrontation, youâ€™ll get one everywhere,â€� Buzhinsky warned. PRESIDENT Obama has deployed US special forces troops along Lithuaniaâ€™s border with â€œaggressiveâ€� Russia. Tensions between Washington and the Kremlin have reached Cold War levels amid reports Vladimir Putin is deploying nuke-ready missiles in the Russian province of Kaliningrad â€“ which borders Poland, Belarus and Lithuania. North Korea fired a ballistic missile into the sea early on Sunday, the first such test since U.S. President Donald Trump was elected, and his administration indicated that Washington would have a calibrated response to avoid escalating tensions. Russia has said it will treat US warplanes operating in parts of Syria where its air forces are present as "targets" amid a diplomatic row caused by the downing of a Syrian jet. Matthew Kroenig, a political scientist at Georgetown University and expert on nuclear deterrence, said Trumpâ€™s threat this week to â€œtotally destroyâ€� North Korea comes out of the U.S. playbook for preventing a nuclear attack. â€œThatâ€™s what Trump was making clear â€” it is not in Kim Jong Unâ€™s interest to attack the U.S.,â€� Kroenig said. Kims are descended from the Great Huns, the ancestors of the Genghis Khan, Atilla the Hun and Timur. Also used to be known as Xiongnu by the Chinese and spoke Altaic language. He swept all before him and subjugated much of the known world. But now, almost 800 years after his death, Genghis Kahn is embroiled in another war as China attempts to adopt the Mongol king as its own national hero. In stark contrast to Mao Zedong, who insisted Genghis was only fit to fire arrows at birds, communist officials and historians now say he represents the essence of new China â€“ a unifying force for a strident land of many ethnic minorities. "We define him as a great man of the Chinese people, a hero of the Mongolian nationality, and a giant in world history," said Guo Wurong, the manager of the new Genghis Khan "mausoleum" in China's Inner Mongolia province. "Genghis Khan was certainly Chinese," he added. The ''mausoleum" was built on a spot the Mongol leader was said to have passed on his way to his final war in 1227, and holds artefacts including his bow and saddle.